Donald Trump has accused the UK media of “fake news” after The Sun Newspaper published an on-the-record interview in which the US president criticised the prime minister’s Brexit plans. “I didn’t criticise the PM,” Trump said at a press conference at the prime minister’s official retreat in Chequers on Friday afternoon. Trump’s comments come after an explosive interview the president conducted with The Sun newspaper, in which he publicly criticised the prime minister’s Brexit strategy and suggested it would kill any chance of a US-UK trade deal. Both Trump and May dismissed the idea that the UK government’s plan makes a trade deal impossible. “If they go in a slightly different route, I hope you’re going to be able to trade with the US,” Trump said. 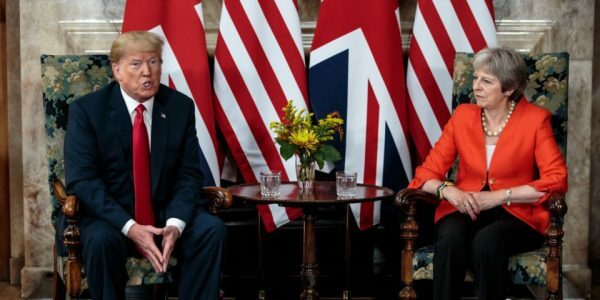 However, the US president said he wanted May to ensure there are “no restrictions” to trade, in the latest sign that the UK would have to lower its standards in areas like agriculture in order to strike a wide-ranging trade deal with the US. This would not be possible under the Brexit plan she unveiled to ministers last week. He also suggested that Boris Johnson, who resigned as foreign secretary this week over May’s plans, would do a better job. The interview was published as Trump dined with the prime minister at a black-tie dinner at Blenheim Palace. As images of the front page story were released on Twitter, fury spread among UK diplomats. Trump also lashed out at US broadcasters CNN and refused to take a question from them. “I don’t take questions from CNN. Fake news,” he told their reporter. In a statement, a spokesperson for the Sun said the president had “essentially retracted” his claim that their interview was fake news.